Wee whose names are here subscribed doe desire that Richard Kelshaw (of Sprodbrough of the Wapontake of Strafford & Tickhill) to be admitted Penc[i]oner in the stead of William Adams of Hampall lately deceased And that accordingly hee may receive his penc[i]on at the next Sessions at Rotheram, given vnd[er] our hands this seaventh day of April in the 25th yeare of his Ma[jes]ties Raigne Anno D[omi]ni 1673. To the Treasurer for the Lame souldiers within the west Ridd[ing] of Yorke. Ponte[fract] sessions viii April 1673. 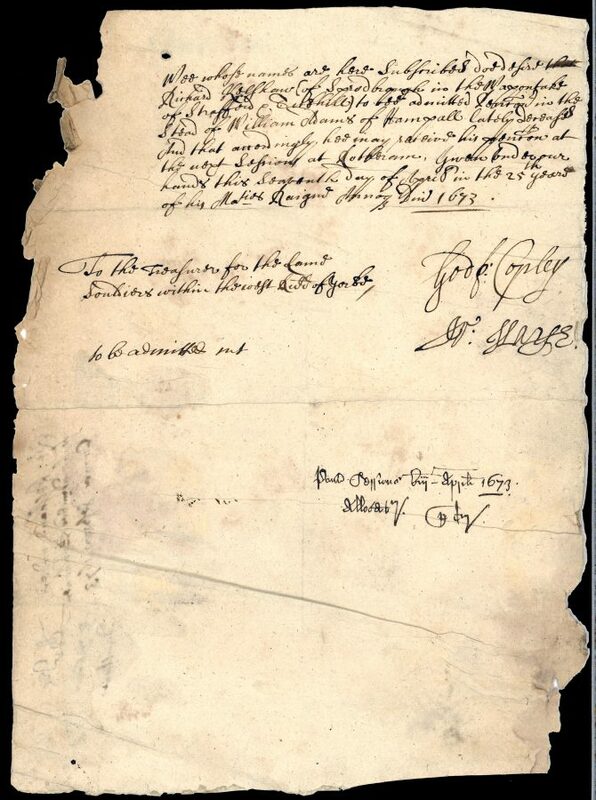 We whose names are here subscribed do desire that Richard Kelshaw (of Sprotbrough of the wapentake of Strafford and Tickhill) to be admitted pensioner in the stead of William Adams of Hampole, lately deceased. And that accordingly, he may receive his pension at the next Sessions at Rotherham. Given under our hands this seventh day of April in the 25th year of his Majesty’s reign, in the year of our Lord 1673. To the Treasurer for the lame soldiers within the West Riding of York.